Soren “Scraps” DeSelby, who had a stroke last October, writes eloquently about his struggle to recover. More than 40 million bags were misplaced by airlines in 2007. Of those more than 1 million pieces of luggage were irretrievably lost. Citizens of Argos, you Elders present here, I shall not be ashamed to confess in your presence my fondness for my CEO, billions of dollars of losses notwithstanding…. (3) Booksonmars recently excerpted Samuel R. Delany’s thoughts about Red Planet juvies. In the end, Champi would be a worthy match for his Yale counterpart, Brian Dowling, who is best known today as the helmet-wearing B.D. character in “Doonesbury” (classmate Garry Trudeau had already begun drawing the strip in the Yale Daily News). (6) A Canadian filmmaker plans to install a mini camera in his prosthetic eye to make documentaries and raise awareness about surveillance in society. Rob Spence, 36, who lost an eye in an accident as a teenager, said his so-called Project Eyeborg is to have the camera, a battery, and a wireless transmitter mounted on a tiny circuit board. (8) Publishers Weekly reports that Beacon Press will publish a graphic adaptation of the late Octavia Butler’s novel Kindred. (9) If Ghostbusters can make me associate New York with Armageddon, why the skepticism about the makers of “Kings” being able to pass the city off as another locale in the Bible? Would you ever choose New York City? (10) When the flying car finally arrived, I wasn’t expecting there to be any doubt that it could stay aloft longer than the first Wright Brothers flight at Kitty Hawk! Logging 37 seconds in the air, a prototype of a flying car completed its first test flight earlier this month in upstate New York. A Finnish programmer who lost his finger in a motorcycle accident has now replaced it with a prosthetic finger that has a USB drive built in. (12) A co-founder of the Sci Fi Channel is grumpy that they changed the name. Before the Sci Fi Channel launched, Isaac Asimov (a member of the Sci Fi Channel’s Board of Advisors along with Star Trek creator Gene Roddenberry, Laurie and I presented the concept of a 24-hour cable TV network dedicated to science fiction to a packed room of SF writers at the Science Fiction Writers of America meeting…. I was booed. Then Isaac started to speak and said that the name had to be Sci Fi Channel and not the SF Channel in order to draw a wide, diverse audience and be successful. To be in a financial position to acquire and produce the best programming. That’s really what counts, right? The writers came around and agreed. Heck, it was Isaac Asimov saying “Sci Fi Channel” was OK, and that was that. This year is different “because it’s really astonishingly nice company to be in,” Gaiman wrote. It’s not just the weird extraterrestrial creatures running amok on Earth, sneaking up on decent, hard-working, small-town folks and reducing them to puddles of goo; we’re used to that. It isn’t even the aliens’ shiny spaceships, with their inexplicably powerful thrust and sinister but somehow festive blinking lights. What feels galactically remote in “Alien Trespass,” and in the half-century-old movies it evokes, is the people, the “ordinary” human beings whose existence is so direly imperiled by superior intelligences from far, far away. You might not see the new Star Trek movie before May 8, but Paramount knows you’re going to love it. That’s why they’re already at work on the sequel. Variety reports Roberto Orci, Alex Kurtzman and Damon Lindelof are writing the screenplay for the next Trek movie. Paramount is aiming for a 2011 release. J. J. Abrams and Bryan Burk will produce, but no decision has been made on whether Abrams will repeat as director. A new fantasy film showcase, the Maelstrom International Fantastic Film Festival (MIFFF), debuts in Seattle this September 18-20. Full press release appears after the jump. 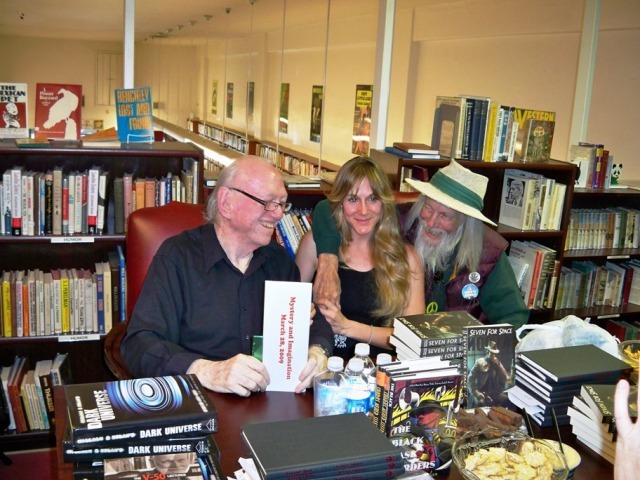 Our friend (as well as Diana’s APU colleague) Joseph Bentz is interviewed today on novelist Patty Hickman’s blog Words to Go. A prominent topic in the interview is Diana’s chicken, who smiles for the camera here. Corflu Cobalt will take place March 19-21, 2010 in Winchester, England. The bid was accepted at the recent Corflu in Seattle. Rob Jackson will chair. The Winchester Hotel will host the con. In addition to chair Rob Jackson the committee includes Pat Charnock (memberships), Graham Charnock (programme), John N. Hall (treasurer), and Linda Krawecke (hotel liaison). You can contact the con by e-mail at cobalt@corflu.org. Prosecutors reviving the case have subpoenaed Katherine Koppenhaver, a handwriting analyst who has testified in more than 350 cases…. Koppenhaver said yesterday that she gave verbal, not written, findings for the newspaper story. But she reiterated that the known Linda Sohus writing sample and the postcard were written by different people…. Koppenhaver and the dissenting analyst have been subpoenaed in the case. The third specialist contacted by the Pasadena newspaper, Karl Schaffenberger, could not be reached yesterday for comment. A Los Angeles County grand jury is interviewing witnesses in the Sohus disappearance case the LA Times reported on the March 27. Prosecutors declined to discuss their evidence with the media, while attorneys for “person if interest” Christian Gehartsreiter said they hope the proceeding will remove their client from suspicion. 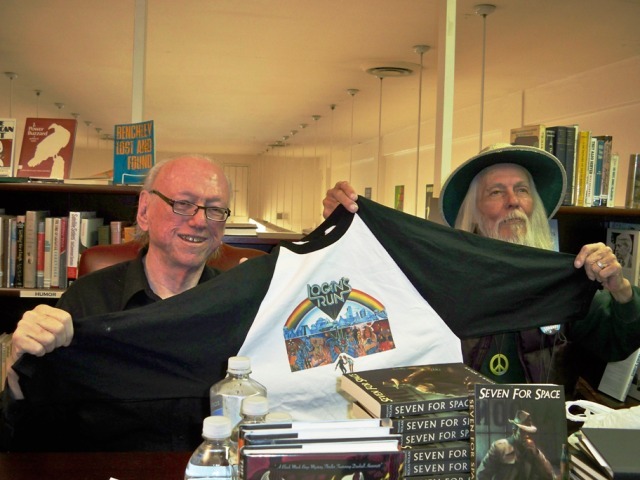 John King Tarpinian snapped these photos of William F. Nolan and George Clayton Johnson during their appearance at Mystery and Imagination Bookshop in Glendale, CA on March 28. The picture on the left shows the duo holding up Bill’s early birthday gift to George. On the right, Bill and George flank “Sea J,” Erv Kirshner’s assistant videographer. John Wayne Sasser’s photos from Forry Ackerman’s memorial at Hollywood’s Egyptian Theater are now online.